Laura Harms, a.k.a. 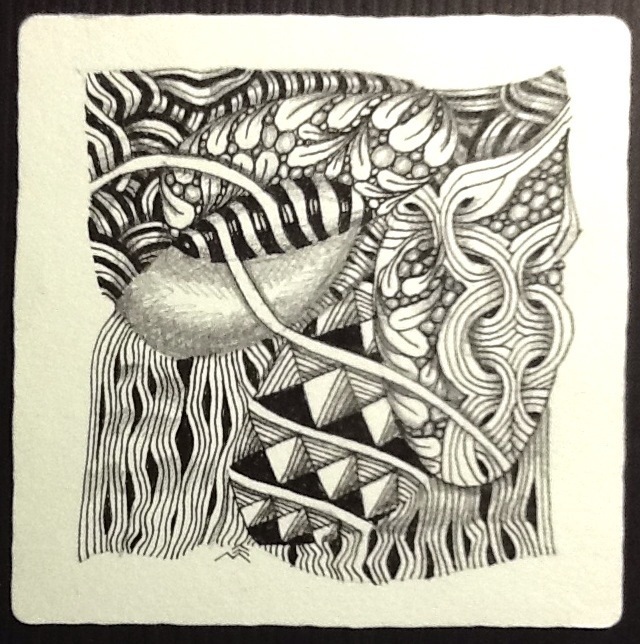 the diva czt has been issuing Zentangle® challenges for two years, now. I’ve been joining in as I am able. I didn’t complete the looped border string challenge presented last week by guest diva Margaret Bremner. I began two tiles, one during lunch time at work, and one at home, but didn’t make the posting deadline. Actually, I was finishing a group tangling collaboration that began back in September at the czt training in Providence. But that’s another post. So here are my contributions to challenge 100 (and 99 too). One evening during the heat and drought that stormed Wisconsin this summer, I grabbed my mail as fast as I could so the 100 degree air would stay outside the house. There in the stack was a post card announcing an event at a retreat center about an hour from my home. I was invited to come and learn the Zentangle® form of drawing repetitive patterns as a way of meditation. I was more than intrigued. I mean… patterns? …meditation? How cool was that?! Now that I’ve had a couple of weeks to investigate, I can tell you that, at least for me, the Zentangle art form has been an incredible discovery. It’s more than just doodling (or, in Zentangle terminology, tangling), because of the mindful and focused nature of the mark-making. It has renewed my love for— and practice of— a daily drawing ritual. It has helped me clarify and reinforce the direction I’ve been heading with my painting practice. The best part is that it is deliciously simple to do, even for non-artists. 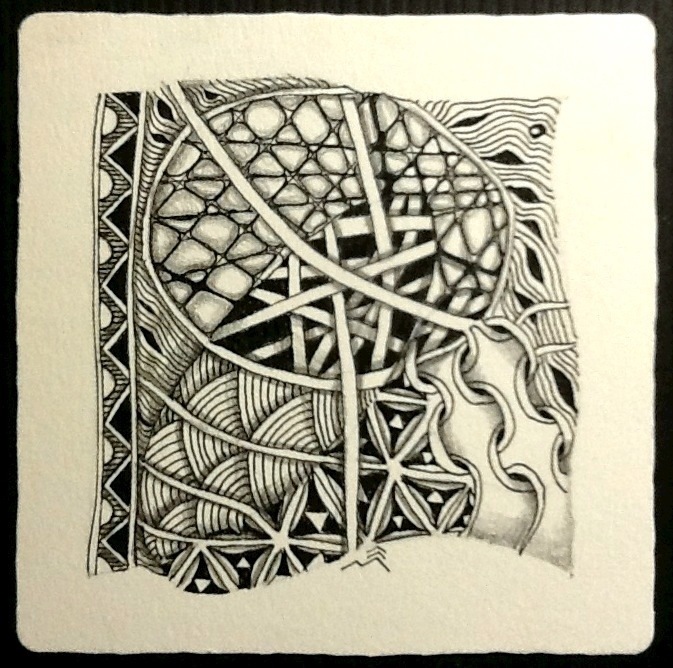 I’ll add some of my own tangles here, and inspiring Zentangle work by others to my blogroll, but should mention the creators of the copyrighted Zentangle art form and method, Rick Roberts and Maria Thomas. Their website and their blog can tell you a whole lot more, and may lead you in directions you never thought possible. Enjoy! 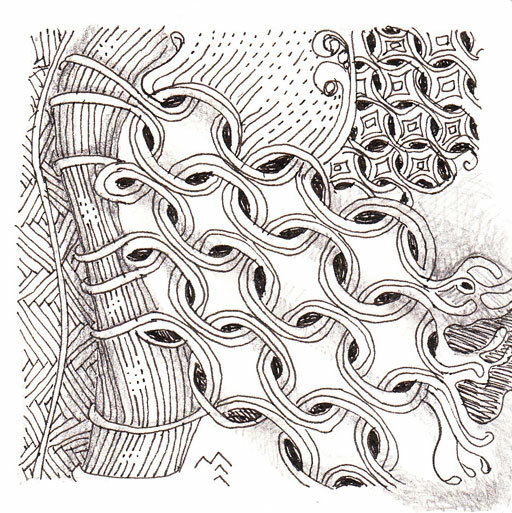 One of the first tangles I made using the materials in my new Zentangle kit. Patterns I used: Mi2, Shattuck, Zander, and Msst.